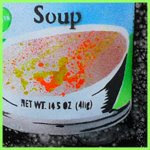 It may just be my undying love for Andy Warhol's work but I love anything that has to do with soup cans and art, (especially soupcanart). Check out Andenken again this Thursday and view the work of Jef Kopp (above), Sandi Calistro, and Ian K. Millard. Other artists showing include; Kill Pixie (Australia), Fafi, Koralie, Alexone and Amandine Urruty (France). As always they'll have drinks, a Dj and a fire sculpture.